There are plenty of examples of glitches in one game being officially adopted features in later editions, but the Spy may be the only example of a character created that way. A bug in the Quake engine (which was used to create the original Team Fortress mod) would sometimes make players on one team appear in the colors of their opponents, so that was developed into a full and distinct class. And his ability to turn invisible? Based on a server-side mod. Is nothing about this guy original? Before the Meet the Spy video, there was some question about what accent Spy was supposed to have - there was a whole edit war about it on Wikipedia. His bio says he speaks French, Spanish and Catalan (but says nothing at all about English, meaning that any of dialogue you get from him is apparently being translated for your convenience). Like James Bond, Spy wears a fancy suit - TF2 gives all its characters unique silhouettes so they can be told apart at a glance, and while Spy has the same general physical size as his mortal enemy, the Sniper, the fact that he's not encumbered by all sorts of gear sets him apart. Heck, he doesn't even wear a patch displaying his class emblem, making him the only one in the game for whom that's true. The original model had an armband, but they did away with that before the game went live. 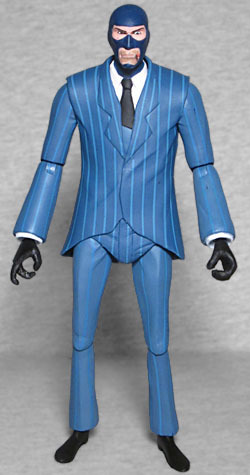 The suit has pinstripes in a lighter shade, and his necktie is two-toned. 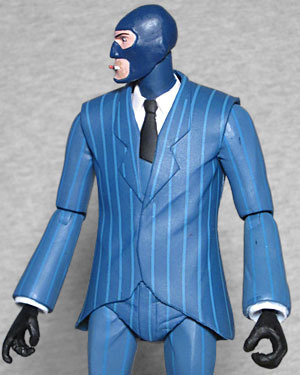 The suit may be James Bond, but the mask is more Diabolik - though Spy's has a mouth-hole, so he can smoke his cigarette. Eh, what do you want? He's French and it's the 1960s; smoking was normal then. The cigarette is a permanent part of the figure's sculpt, molded into the corner of his mouth because doing a separate piece would likely have been too difficult and expensive. And it would have left him with a small hole in his mouth when you inevitably lost it; can't have that! Spy has super skinny legs, which look like they should snap under the weight of his torso - not that his upper body is huge or anything, they're just that scrawny. Little twigs, they are! 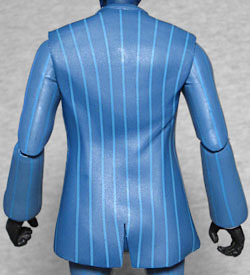 There aren't many details in the sculpt to worry about: the suit is immaculately tailored, so there are even only a few small wrinkles to be found on his jacket and behind his knees. His sleeves and pantlegs are flared, and he wears gloves to prevent any stray fingerprints from giving him away. 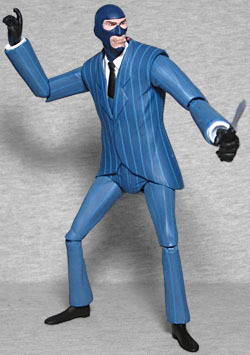 Spy has balljointed ankles, swivel/hinge knees, swivel thighs, swivel/hinge hips, a balljointed waist, swivel/hinge wrists and elbows and shoulders, and a balljointed head. You may think the balljointed ankles would make it very easy for the toy to fall over, but he's so slender and light that it's not much of an issue. Though we'll say again that "capture point" display stands would have been a brilliant inclusion for this line. Sadly, the articulation is not quite good enough to get the toy to "spycrab," but that's not really an issue, since we don't get his disguise kit as one of the accessories. What we do get are his other three starters: the revolver, knife, and sapper. The revolver has gotten warped by its time in the package, so it would either misfire or be able to shoot around corners if he tried pulling the trigger. The butterfly knife is a solid mold, so don't expect to twirl it around like he does when equipping it. And the sapper just makes us miss the Engie's buildings even more than we already did. 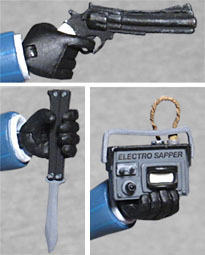 The right hand is shaped to hold the gun, and you get your choice of two left hands to hold one of the other weapons. It would have been cool if he'd come with one of the paper masks that serve as the visual representation of his disguise in the game, but you could print those out yourself easily. The set also includes a card (reproducing the Spy poster art) that has a special code you can redeem for a free in-game item. Yes, everybody gets the same item. And since this is Team Fortress 2, the item is... wait, it's not a hat?! Will wonders never cease! 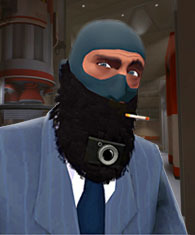 He gets you the Camera Beard, a silly item that is just exactly as described: a camera, hidden inside a beard. While it was originally classified as a hat, it was later reslotted as a cosmetic, meaning you can wear it with any other hat you like. Remember how I said the Pyro alternates between being my second and third most-used character? The Spy is the one that keeps swapping back and forth in there. So for me, the wait for this figure was excruciating, but absolutely worth it - now NECA, how about a 100% clear version that would represent his "cloaked" mode?